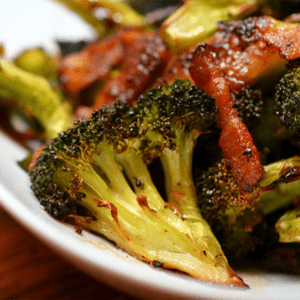 Inspired by Jaden Hair’s recipe for roasted cauliflower and bacon, I made some roasted broccoli with bacon tonight. First things first: I cut up my broccoli into florets. No, I don’t normally wash ’em unless they’re really dirty, but I do inspect for bugs and I toss the florets that are super-infested. Organic broccoli often features small crowns and large stems so I normally trim the tough skins from the stems and throw them in as well. 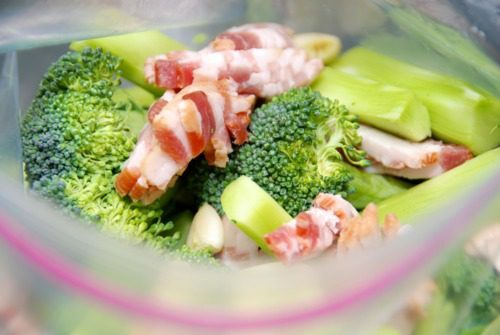 Then, I tossed the broccoli, bacon, and garlic cloves in a gallon-sized Ziploc bag to store in the fridge until I was ready to roast them. 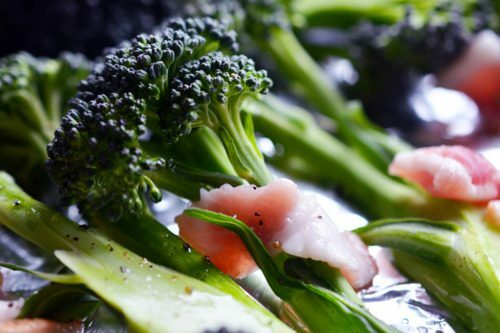 When it came time to roast off the broccoli, I preheated the oven to 400 F and added some fat in the Ziploc bag along with a generous amount of salt and freshly ground black pepper. I sealed the bag up and shook it vigorously, and then I dumped the contents on a foil lined baking tray. 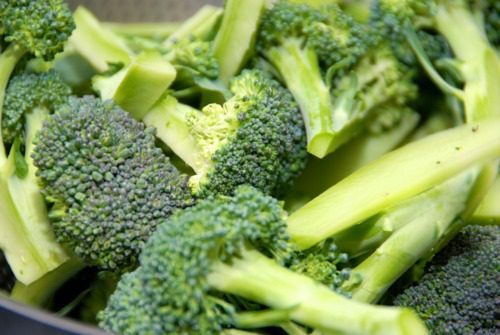 Make sure it all fits in one layer or the broccoli won’t brown properly. 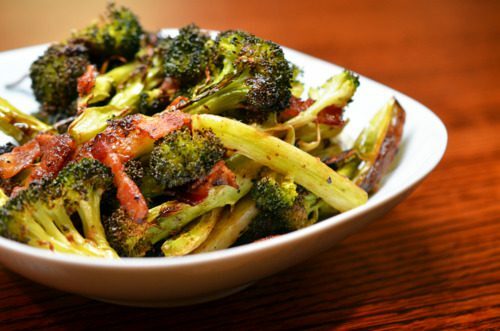 I oven-roasted the broccoli for 30-35 minutes, rotating the tray and flipping the contents every 10 minutes or so. Really tasty. For variation, I think this dish tastes great with a bit of acid (a squeeze of lemon or a splash of your favorite vinegar) and/or a shower of microplane-grated parmesan cheese (if you tolerate dairy).